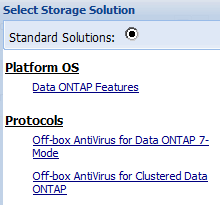 Off-box Anti-Virus is available for Clustered Data ONTAP in 8.2.1. There are a few providers who support this solution (McAfee, Trend, Symantec ...) - here I’m going to focus on McAfee. This intention of this post is a quick install guide - enough to get it up and running in a lab so we can configure it with CDOT. ***CDOT AV Connector uses an SMB 2.0 connection to CDOT, hence why Windows 2003 (SMB 1.0 only) is ruled out as an O/S for the VSCAN server. Double-click the setup.exe file and follow the prompts to install the software. Note: VSEfS can also be installed from the command line, or deployed using ePO. IMPORTANT: The rest of this document only considers a standalone install of VSEfS with the purpose of testing this out in a lab. Read this for configuration information with ePO. i. Run the .exe file. ii. Follow the onscreen prompts to complete your installation. 9) Click OK to save the configuration. *There is a free trial of VSE 8.8 and VSEfS 1.1 here. To test this solution in a lab you’ll need a CDOT 8.2.1 SIM, the AV Connector for CDOT, VSEfS 1.1, VSE 8.8, and Windows 2008 SP2 or better. One nasty virus could expose your financial information or stop your computer from working at all. What you need is the best antivirus software possible on your computer. Luckily, some of the best are also completely free..
Is there a difference in implementing on 8.3?